Master John R. Austino, Jr., was born in 1965 in Bridgeton, NJ. He began his karate training in 1982 and has trained under Masters John Austino, Sr., Phil Maldonato, Ric Pascetta, and Maestro Peter Urban. He is a top competitor in the martial arts both locally and nationally. In 1986 he made it to the finals for the USA. AAU Olympics tryouts and placed third in fighting. In 1989 he opened his first karate school. In 2004 he was promoted to 7th Degree and awarded title of Kyoshi by Grandmaster Peter Urban. Master Austino was an active competitor in the United Martial Arts Referees Association League. During 1992, 1993, and 1994 he became the U.M.A.R.A. League Black Belt Light Weight Fighting Champion. Now he dedicates his time to teaching and is a certified U.M.A.R.A. “A” Level Referee. In addition to teaching the marital arts, master Austino is a police officer for the State of New Jersey Division of Youth and Family Services (DYFS). He started his law enforcement career in 1993 with the Vineland, NJ Police Department. He is a Defensive Tactics Instructor. In 1995 he was instrumental in developing a Defensive Tactics program for the Vineland Police Department and Police Academy. In 1995 he completed SWAT I and II level training with the Los Angeles Police Department. From 1995 to 2000 he was a member of the Vineland SWAT Team. In 1998 he received certification in GRAPLE – Gracie Resisting Attack Procedures for law Enforcement under direct instruction of Royce Gracie. From 1995 to 2003 he has certified over 500 police recruits in Defensive Tactics, Handcuffing and Baton training. In 2003 he transferred to the State of New Jersey Human Services Police Department and in 2005 helped to develop a Defensive Tactics program for the State of New Jersey Human Services Police Department. 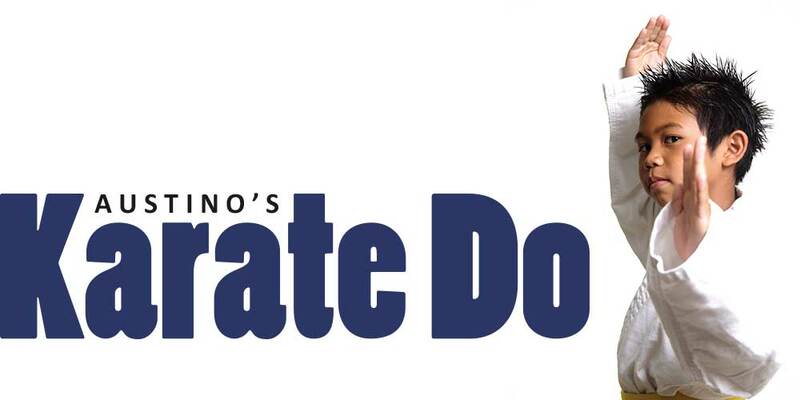 Austino’s Karate Do promotes non-violent resolutions to conflict. Our methods help you to explore and understand conflict through role-play and other exercises. Students will learn confidence, self-discipline and control as they learn how to act and react to self-defense situations. All our students are treated with respect and are taught to return the same respect to others. At Austino’s Karate Do, we believe in praise, encouragement, and positive reinforcement. We encourage our school age students to maintain good academic grades. All Students must maintain good academic grades to be promoted to a higher rank. Karate is an exciting, unique, and multifaceted art. It is a blend of physical, mental and spiritual elements. Karate is a fun yet challenging. Karate is the perfect lifelong activity! It can be practiced at any age, it does not require exceptional flexibility or natural talent, and requires no special equipment, facilities, or even other people to practice with. Plus, it gives you the ultimate in self-defense. The physical aspect of karate is evident. However, the mental and spiritual qualities of karate are not always evident to the beginner. These qualities include development of self-confidence, self-control and discipline to achieve success, calmness in emergencies, ability to deal with stressful situations, and development of leadership skills. Studying karate improves a lot more than just kicks! It improves concentration, self-discipline, and grades! Students will develop increased coordination, balance and agility. Children/Teens/Adults will practice basic and advanced moves, self-defense techniques, forms and sparring. The Kids program strengthens the student by building character, confidence and self-control. It channels their energy in a positive way which promotes self esteem and a good attitude. The self image, confidence, discipline and control the student develops today will be carried by them through life. Karate training also gives children something gravely needed in today’s society – the strength to say “NO” to negative peer pressure, and to replace the negatives with positives in thought, word, and deed. Our karate students become leaders and not followers within their peer groups. Karate offers your child benefits critically needed in today’s fast changing world! Clenched Fist insignia by which USA Goju Ryu is identified. While most karate styles teach the use of hard blocks and hard strikes, GoJu teaches the hard style but also emphasizes the “Soft” style. It is a style that is compatible for both men and women, young and old. GoJu Ryu (剛柔流), (Japanese for “hard-soft style”) is one of the main traditional Okinawan styles of karate, featuring a combination of hard and soft techniques. Both principles, hard and soft, come from the famous martial arts book Bubishi, used by Okinawan masters during the 19th and 20th centuries. Go which means hard, refers to closed hand techniques or straight linear attacks; Ju which means soft, refers to open hand techniques and circular movements. “Do not be struck by others, do not strike others, and avoid trouble at all costs”. This teaching is an essence of Goju-Ryu Karate-Do. In other words, after acquiring physical strength, one’s attitude towards life should be the pursuits of a tranquil existence and an unfettered mind. This state of peaceful coexistence between body and mind can be achieved only after rigorous training and tireless efforts on the part of the student of Goju-Ryu Karate. Goju-Ryu Karate, can benefit men, women and children. Through rigorous training Goju-Ryu Karate will develop strength, quickness, balance, and coordination. At the same time Goju-Ryu will increase one’s ability to concentrate, increase one’s ability to focus leading to self-discipline, and self-control. Regular training will enhance circulation and digestion, help reduce back and joint problems, and help relieve stress. Kobudo (Ancient Weapon Arts) is the study of “weapons”. “Weapons way” a generic term coined in the 20th century, which can be used to describe collectively all Okinawan weapon combatives. However, it is more accurate to specify “Okinawan Kobudo” in order to distinguish it from “Japanese Kobudo.” At Austino’s Karate Do you will learn the weapons of OKINAWAN KOBUDO – Weapon Arts of the Farmer and Fishermen and JAPANESE KOBUDO – Weapon Arts of the Samurai. The benefits from training Kobudo on a physical, mental and spiritual level are the same as Karate. Kobudo training develops physical fitness and positive character traits. The study of Kobudo also works in conjunction with Karate and balances out the Karate practitioner’s training. In ancient times, weaponry and empty hand techniques were, for the most part, studied together. Kobudo also teaches how to use everyday items as self-defense weapons and the weapon itself empowers the person using it against an attacker. You may sign up for the monthly plan after completing the $9.95 one week trial. The one-week trial is required before signing up for a regular plan. The $9.95 fee can be applied toward your first month’s enrollment.